The Qasus do not normally cry, but this felt nothing like normal. Like hundreds of thousands before them and untold more to come, the Iraqi family had just completed a disorienting dash across Europe and found refuge in Germany. "We used to have a home. A fine life. We used to have money and never needed anyone," said the mother, Bessi Qasim, who uses her father's surname. Dabbing at her eyes, the 42-year-old homemaker said her job now was to make a new home. "I just want my children to be happy and see them growing up. I want to be able to replace the bad memories with new good ones." Those bad memories include at least three brushes with death: with murderous invaders, the fear of drowning, a daughter's cancer. "We took nothing with us. I didn't need to see IS to know how horrifying they are," said Samir, 45, who abandoned his convenience store in Sinjar. He said cousins who stayed behind have vanished. "We had a miserable life," said Samir, who kept his family out of Turkish refugee camps and rented an apartment, but struggled to pay bills by working illegally part-time in construction jobs. "I reached a point where I couldn't take it anymore. We had no dignity. I just wanted my children to live in a safe, peaceful place." Samir paid in part with money provided by his brother, who had already made it to Sweden. The boat appeared more substantial than the typical rigid inflatables that smugglers deploy as one-use throwaway items. That didn't stop the engine of the overloaded boat from breaking down midway, leaving the Qasus to bob helplessly on the choppy Aegean. "I was 95 percent certain that death would take us," said Samir, who said he prayed for God to claim him and save his loved ones. An AP photographer spent that week following the Qasus as they nimbly hopped from border to border. Their rapid progress reflects Europe's concession that German-bound asylum seekers should not be left pointlessly stranded for days outdoors in the bleak Balkans winter. 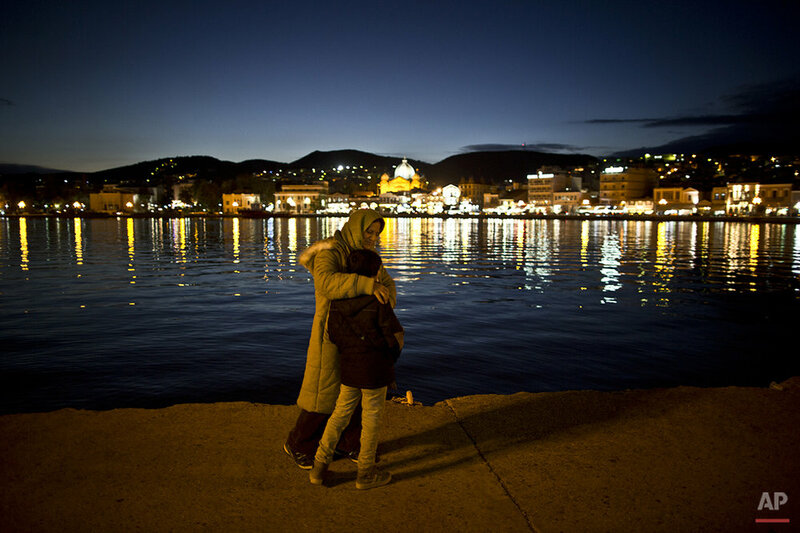 Within two days, the Qasus had traveled by midnight ferry from Lesbos to Athens and then by bus to Greece's northern border with Macedonia. They slept chiefly on trains, buses and benches while passing through registration centers in four Balkan countries, getting their first proper sleep in a bed in a massive tent holding hundreds of asylum seekers near the Austrian city of Salzburg on Dec. 7. In February 2012, Turkish doctors performed a life-saving liver transplant on the girl, removing a cancerous section and replacing it with a liver portion donated by her mother. The liver is the only human organ able to regenerate in this way, but Dunia remains vulnerable to infections and must take daily injections to block antibodies from attacking her mother's donated tissue. Underscoring her vulnerability, she wore a surgical mask throughout December's odyssey from Turkey to Heidelberg. "I want to be cured and grow up. I love Germany and the people here," Dunia said. Samir said the German doctors at the Heidelberg camp "have been so kind to us. As soon as they learned about her situation, they went through all the proper procedures to check her and told us that she is fine." Dildar, 10, now dreams of becoming a soccer star in Germany. As he kicks a ball outside with siblings Dilshad, 17, and Delphine, 18, their talk turns to the possibility of school in January and of using one of their first German words: "Danke" — thank you. "I dream of helping people, the ones who need the most," she said. "Iraq is destroyed, shattered into millions of pieces," Samir said. "It's no longer my home and no longer a home for my family. ... Home is where your family is safe and happy." Text from the AP news story, Iraqi family braves perilous journey to new life in Germany by Muhammed Muheisen. Muheisen, the Associated Press' chief photographer for the Middle East, Pakistan and Afghanistan, followed the Qasu family from Greece to Germany on Dec. 3-10. Shawn Pogatchnik in Dublin contributed to this report.